Knees do not wear out evenly. Sometimes one part of the knee is perfectly fine while another part is completely destroyed. Depending on where the damage is in your knee, a partial knee replacement may be an option for you. A partial, or unicondylar, joint replacement resurfaces only the worn out portion of the joint, either the inside, outside or kneecap, leaving the rest of the joint alone. To work properly, the components must be put in extremely accurately. Even a millimeter or two of tilt or rotation dramatically affects the wear patterns and longevity of the components. Think of how a car out of alignment means rapid tire wear. Most surgeons are unable to perform partial knee replacements because of how difficult it is to achieve the required accuracy and so in many cases, even if a patient meets the criteria for a partial knee replacement, a more invasive total knee replacement will be offered. 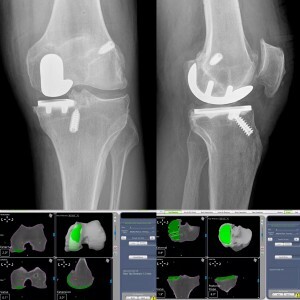 A computer builds a custom 3D model of the patient’s knee based on the CT scan. Before surgery, the surgeon plans the placement of the components using the virtual model, using real-time live motion data to adjust the position of the implants. 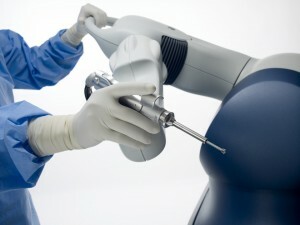 During surgery, the robotic arm and computer navigation provide the surgeon with pinpoint precision (within 1mm and 1 degree of the plan) to enable optimal implant positioning and alignment. Just a few millimeters of bone need be burred smooth to allow for the implants to be fixed to the surface. Exposures are 2”-3”, no muscles are cut, and no tourniquets are used. Blood loss is minimal, requiring no transfusions. Autologous Platelet Rich Plasma (PRP) stem cell application can be used to enhance the healing process during the closure. Skin adhesive (instead of staples) holds the skin edges together, reducing the risk of contamination while allowing patients to shower the next day. Patients walk from the clinic; most are off prescription pain medications within a week, and feel better than before surgery in just 3-4 weeks. With a partial knee replacement, the procedure is so minimal that in most cases, patients walk out of the surgery center 1½ hours after surgery and begin physical therapy the next day. Book an office evaluation or set up a phone consultation today and find out if you meet the criteria for a partial knee replacement. "I am biased towards only replacing the parts that are worn out. I prefer to delay a full replacement if I can resurface the medial, lateral or patella femoral joint alone or in combination. 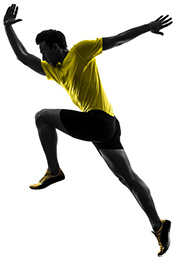 My patients recover faster, the knees feel more normal, and they do more sports with them." Hear from patients who have benefited from a MAKOPlasty Partial Knee Replacement -PKR. A partial, or unicondylar, joint replacement resurfaces only the worn out portion of the joint, either the inside, outside or kneecap, leaving the rest of the joint alone. For unparalleled accuracy in placement, Kevin R. Stone performs a MAKOplasty® partial knee resurfacing procedure using the MAKO Surgical Corp Robotic Arm Interactive Orthopaedic System. 25 years ago, our patient injured his knee playing rugby and had his meniscus removed. By the time he came to see Dr. Stone, he was bone-on-bone on his left knee and had had 4 surgeries. All orthopedists he went to see told him he would need a total knee replacement. Dr. Stone was able to help our patient avoid a total knee replacement by doing a MAKOplasty partial knee replacement. " For me this was the perfect surgery, I was only on crutches for four days" He was walking on his knee within a week and riding his bicycle within 2 weeks. As an ultra athlete, within two months he was doing 100 mile rides. Less than three months he was skiing - all without pain. Check out the video to learn more about what he's been up to within a year of surgery....including biking around Europe! " I can't say enough good things about this." Hear from patients who have benefited from a robotic-assisted partial knee replacement.